Modern technology was a wonderful thing. During the daylight hours Beringer planted tiny glasses around the necropolis, rigging them to alert him when they spotted motion. As the necropolis closed, he hid himself away inside an unused mausoleum and waited for nightfall. The taint of the Void was upon this place. Flowers lay scattered on the flow, shriveled and brown. The hexagram on the wall was scratched and faded. The tombs were empty; scuff marks around them revealed that they had been opened recently. He scattered a generous handful of powdered aetherium on the floor and the sign, and retraced the hexagram with his finger. Light poured forth from the symbol, clearing away the corruption in the room. He found a comfortable spot, set his telecrystal on the floor, and waited. The glasses were set to activate when they detected movement from living beings the size of a human. Through them he watched the last visitors leave the necropolis. The groundskeeper did his rounds, chasing away crows and tidying the graves. The old man’s route took him to the center of the necropolis, where the paling tower stood. He opened a small hatch and sighed. Strange things tended to happen in necropoleis without a paling-stone. The groundskeeper gathered his things, locked up, and left just as the sun set. Hours passed. Beringer sat cross-legged, straightened his back, and cleared his mind. Three hours later, the telecrystal vibrated. He touched the surface. The crystal recognized his energies and glowed a faint blue. It projected a window in the air, displaying a live feed from Glass 5. It was mounted on a statue of Hodegetria Mariam overlooking a section of the perimeter fence where the spikes had been worn down over time. Two youths, one male and one female, approached the fence. Both had long black hair, black lipstick, black nails, thick white makeup that covered their skin. He had on a tailored black coat with black pants; she wore a black lace face veil and a tight skirt. Both had gloves and knee-length boots. It wasn’t a cult uniform that Beringer was familiar with, but who knew what cultists thought? The fence was made of simple metal bars hammered into the ground, held together with worn horizontal rods. The girl nudged the boy and pointed. He took off his jacket and threw it over the spikes, tested his weight, and carefully climbed over. The girl followed. Beringer opened other windows, checking the other glasses. No suspicious activity. He returned his attention to the duo. The man retrieved his jacket, and hand-in-hand, they traipsed towards the statue of Mariam. They conferred for a moment, then she broke off and leaned against Mariam. He retrieved a telecrystal from his jacket and recorded the scene. The girl cycled through several poses, each more lascivious than the last. Kids. Iesous save them from their folly. And Beringer found himself blushing and looking away. Blasphemy. Pure blasphemy. As the boy unzipped his pants Beringer checked the graves. The glasses were made exclusively for the Voidguard, and they picked up traces of the Void. Noncorporeal spirits, malformed ghosts and other parasites flitted in and out of attention, gathering around them. When they were finished, more than a few spirits latched on to the duo, sucking out their energies. The teenagers retreated the way they came, oblivious to the denizens of the Void. Beringer sighed, whispering a short prayer for them. Perhaps the Creator has a lesson for them—but then, he wasn’t sure if they believed in him. The City Eternal was no longer the City Faithful. With that diversion out of the way, he had nothing more to do than continue his meditations. Hours passed. And once again, the crystal vibrated. Beringer checked. This time, the glasses had detected motion at the entrance. Four hooded figures entered the mausoleum and pulled weapons from under their cloaks. The one in the lead was a woman; despite her formless cloak her arms and legs gave her away. She had a short-barreled shotgun. It looked like a Branwen Arms Model 850, the barrel sawn off so severely that it barely protruded from the receiver, and instead of a shoulder stock it had a pistol grip. Two of them held Caruso KV12 submachine guns; these looked more like blocks than guns. With this kind of firepower, they were hunting for something. The last one, though, was unarmed. She simply followed her colleagues’ tracks, keeping her hands under her cloak, yet she watched the world with the eyes of a predator. She was likely the most dangerous of the group. Cracking open the mausoleum door, he peeked out. The light of the phone had blinded him, and his eyes struggled to accommodate the night. He awakened his Void Sight, and the world lay itself bare to him. He saw everything in sharp detail, as though he were under the noonday sun. Behind that lay finer details: memory-impressions, lingering energies, emotions, And a thick black miasma that came from the Void. He took a pinch of the Void-stuff, running it over him, melting into the shadows. Even with enhanced sight, he was confident nobody would see him. He eased the door closed, and knelt behind an obelisk. Moments later, the witches appeared, patrolling down the thoroughfare. They moved like professional soldiers, each covering his own arc of fire without straying too far away from cover or each other. A howl pierced the night, off to his right. In a nearby mausoleum, Voidspawn awoke. Half a dozen of them, pulling themselves out of tombs. One of them, the runt of the pack, ventured forth to scout the land. Finding nothing, it signaled its fellows over. The pack swarmed out, hunting for food. The witches crept around in the dark, rearranging their positions. The unarmed one stared at the ghouls. She was brimming with energy; he could sense her unnatural energies from here. It wasn’t the Void, though, it was something else. Not quite Creation either, more like endless potentiality. The in between space before energy took on form. It looked like the coven was ambushing the ghouls. That was wrong. Voidspawn recognize their own. Witches either served or ruled demons, or else were totally indifferent to them. There was no need to hide like that, and demons loathed having humans take care of internal affairs for them. So why...? A ghoul shot up straight and uttered a hunting cry. Energy spiked from the unarmed witch, forming a blizzard that slammed into the ghoul. The creature disintegrated. Beringer blinked, reeling in his mouth. He was right; she was the most dangerous of the lot. She was no mere heretic; she was a hexe. The witches fired, cutting down the ghouls. The shotgunner unleashed another Void bolt, dissolving another ghoul. Damn. He’d missed that one. One by one the ghouls dropped. The last one leapt at the hexe, then abruptly dropped to the ground and dissolved. That was definitely a hex. Behind the witches, dark shadows emerged. Humanoid figures, their features flickering and uncertain, closer to clouds than creatures. They spread out, forming up to surround the witches from behind, and solidified. These were the Defiled, humans lost to the Void, the final fate of all who could not be saved from the Unmaker. And the witches hadn’t noticed. Any other day and he’d let demons and witches butcher each other, then mop up the survivors. He’d done that more times than he’d care to remember. But...but these witches were hunting the Voidspawn, which meant they were on his side, and maybe they weren’t witches. Maybe. He had to be sure. He reached into his coat pocket, grabbing a fist-sized chunk of aetherium. The crystal warmed his fingers to the touch, and through his skin he sent his will. The crystal transmuted into sturdy polymer, growing a high-friction grip. Excess material flowed to the front of the blade, forming a lump. He bound his soul into the crystal, making up for a lack of mass. The lump combined with his offering and transformed, glowing white-hot, elongating and alchemizing into a sword. Soulblades were a direct reflection of the user’s soul, sometimes changing over time as the user changed. Beringir’s soulblade imitated a small xiphos with a neutral handle, just about the length of his arm. The xiphos cooled into a dull gray, gleaming softly with the light of Creation. He surveyed the coming battlefield. The witches were moving up on the ghouls, eager to inspect their kills. Rookie mistake. They had left their backs completely exposed. The Defiled bounded towards them. There were an even dozen in total, the majority on the right flank, moving to swarm the unarmed witch. He searched for the furthest Defiled. There, on the left flank. Focusing on a spot right in front of it, he drew a deep breath. “DEFILED INCOMING BEHIND YOU!” he roared. The moment his breath left his lungs, he touched the Void, bending it to his will. The world folded. His vision blurred, fading into a pinprick. Sounds not meant for human ears buzzed through him. A great force, as unconquerable as gravity, drew him forward through a tunnel of unending dark. Reality snapped back into shape with a loud BOOM. A burst of light exploded before him. The Defiled, stunned, staggered away. Beringer stepped in, ramming the blade into where a human’s guts would be. The short sword ignited with the fury of a star, reacting with the energies of the Void to forge a sunblade, the one thing that could reliably harm a Defiled in this state. Twisting the sunblade, he drew a ‘C’ through the creature and stepped out, turning and powering a stroke through its neck. Its head fell off, and what was left of the Defiled burned away. The surviving Defiled came for him, speeding over, under and through everything in their path. Beringer touched the Void once more, sending a current against the arrow of time. It felt like he was winding up a spring. A wellspring of the Void sprang forth, forming a hemisphere with him at the center. Colors stretched and bled out. All around him, wherever the Void touched, the world stopped. Bringing his sword up to the guard, he dashed up to the nearest Defiled and took its head. Another he slashed from left collarbone to right hip, the third he cut the other way. A fourth was caught passing through a gravestone; he transmuted the short sword into a sunblade and cut the creature and the stone in half. Whatever the sunblade touched burned, melted, vaporised. Whispers grew at the edge of his hearing. A billion tiny tentacles crawled at the edges of his vision. Cold, cold air filled his lungs. Metal danced on his tongue and purple spots grew in his vision. A Defiled stumbled the stasis sphere, and froze. Returning his xiphos to metal, he brought it up to the guard, oriented himself to the nearest Defiled and thrust, covering six feet in a moment. The blade entered the creature’s neck and something in the Void screamed and Beringer cut out and the swirling dark closed over him and threatened to snuff the fire of Creation within and he stepped back and released his hold on the Void. The hemisphere dissolved. The world returned the sanity. Time surged forward, like water breaking through a dam. The Defiled fell apart in triple-quick time. Around him, the Defiled he had slashed vanished in cleansing fire. 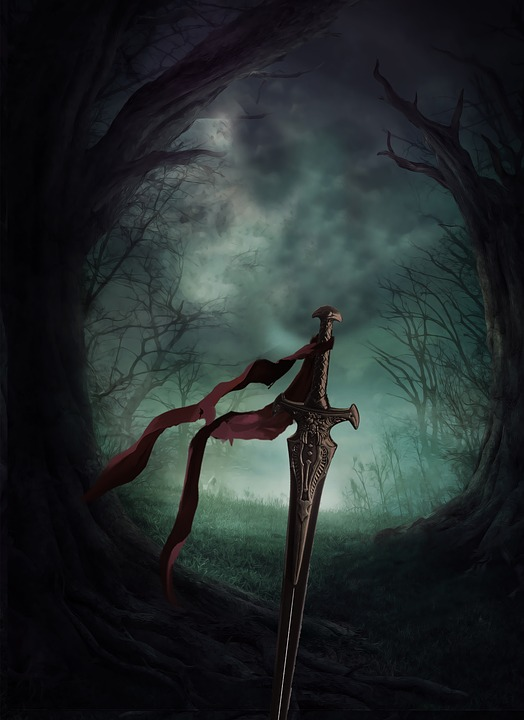 He glanced left and right, sword high, and saw no more Defiled around him. He passed the blade over to his left hand, holding it in a reverse grip, and drew his Lynx 646 pistol. Gunfire erupted around him, interspaced by Void energies. He positioned himself behind a tree and watched. The surviving demons flowed towards the witches, unaware of what he had done. The hexen extended their hands, spewing bolts of black light, and a pair of Defiled blew apart like smoke in a high wind. Two more dispersed. The rest coalesced into a solid, taking on huge, hulking forms and charged the line. The gunmen dumped rounds into them, but it merely slowed them down. Beringer shook his head. They were hunting demons but only used solid shot? Idiots. The women struck the Defiled with thick black bolts and the Voidspawn froze in place. They seemed to grow larger, thicker, harder, and yet more...fragile. The shooters fired quick bursts that exploded the Defiled into pieces. Beringer blinked. He’d never seen witchcraft like that before. And maybe the witches weren’t that stupid; solid shot was easier to obtain than aetherium bullets, and the gunners need only suppress the Voidspawn long enough for the witches to do what they had to do. —across, this time bleeding the excess energy into the ground to materialize in relative silence. He raised his pistol and shot the nearest ghoul twice in the back of the head. The sunshots penetrated the corrupt flesh and detonated. The ghoul twitched and dropped; in his Void Sight Beringer saw the aetherium fireball consume the Void within the creature. Bullets smacked into the tree and the dirt around him. Beringer retreated behind cover. “Void take you! I’m on your side!” he yelled. “Show yourself!” a witch challenged. All the same, he looked past the tree. The hexen did their damned work, dissolving the ghouls with their strange magics. The gunners filled the remainder with lead, and the hexen force-decayed the bodies. Beringer kept low, sneaking behind what he hoped was a sturdy concrete gravestone. A nearby ghoul, bloodstained and broken, appeared around a nearby obelisk and jumped at him. It impaled itself on his blade. Beringer pressed the pistol into its chest and fired twice, kicked it off his burning blade, shot it twice more in the face. Silence fell. Beringer heard his ears ringing. Beringer snapped his head up. A void, a true Void, a complete nothingness, appeared. He saw it only by the profound blackness that contrasted against the rest of his Void Sight. Brilliant colored lights flowed into the heart of darkness, consumed forever. There was only one thing that could do this.